Though they’re best known for spicy foods like chilli crab and char kway teow, Singapore hawker centres also serve up a quick, cheap breakfast. One of the most popular local breakfast items is kaya toast, a tropical twist on toast and eggs with enough calories to last you through lunch. 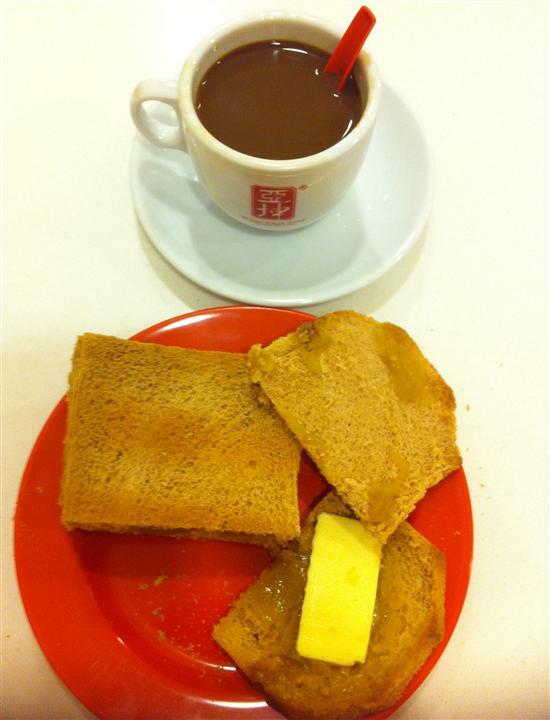 The perfect Singapore breakfast — kaya toast and kopi. Kaya is a uniquely Southeast Asian jam made from coconut milk, eggs and sugar. It’s usually slightly green in colour — not because it’s gone off but from the addition of pandan leaves which give kaya a mild, vanilla-like flavour. The texture of kaya is similar to custard and it can be used as a filling in sweet buns or easily spread on toast. In Singapore, kaya toast is made by slathering kaya and a generous pat of butter or margarine between two pieces of crispy bread. Many hawkers still prepare the toast the traditional way, shunning an electric toaster and crisping the bread over a charcoal fire. Kaya toast is also a bargain with a generous plate costing S$1.00-2.50, depending whether you’re eating at a hawker centre or an air-conditioned cafe. But Kaya toast isn’t just for breakfast. 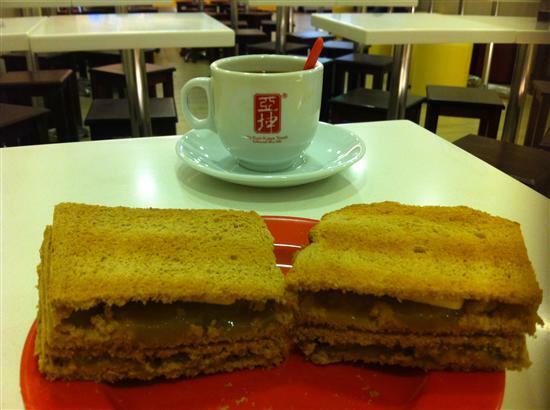 Perhaps because it goes so well with a cup of strong Singapore-style kopi, kaya toast is also a popular mid-afternoon snack. The Sweet Spot, one of the stalls at open-air Gluttons Bay hawker centre, has turned kaya into dessert offering ‘kaya fondue’ – fried banana fritters that you dunk in sweet, creamy kaya. Kaya toast contains your recommended daily limit of sugar and margarine. A jar of kaya also makes an excellent souvenir of Singapore and, unlike chilli crab paste or chicken rice herbs, you don’t need any culinary skills to use it – just spread it on toast. Ya Kun Kaya Toast, the leading kaya toast chain since 1944, sells its kaya in gift packs or you can find kaya at any Singapore supermarket.